There are numerous misconceptions and superstitions connected with snakes that make them repulsive to the common man. The negative connotations lent to them by some religions do not do their reputation any good either. The fact remains that snakes are integral in their positive value to the environment and many are killed due to human fear or the destruction of their habitat by so called development. How does one combat the issue of saving these singular creatures and promote respect for them for their contribution to nature? Dispensing knowledge and spreading awareness is what environmentalist Nirmal Kulkarni has chosen to do. 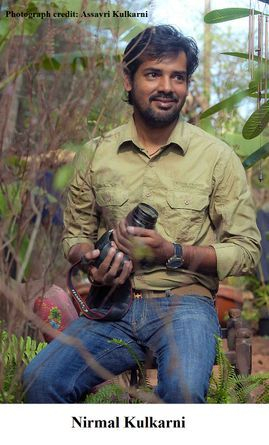 Nirmal Kulkarni has made quite a name for himself as an environmentalist, herpetologist and wildlife photographer. Moving on from a bachelors in Applied Art from the Goa College of Art, Nirmal acquired a masters in Environment and Ecology from the Indian Institute of Environment and Ecology, New Delhi. He is the chairman of the Mhadei Research Center, which has done extensive work in documenting Goa’s ecological treasures, and he is the founder of Hypnale Research Station (named after the hump-nosed pit viper found in the Western Ghats). Some of the many awards Nirmal has won for his work are the Sarpamitra Award by the Indian Herpetological Society for reptile conservation in the Sahyadris, the Ecologist of the Year Award by ECHO Goa, and the Carl Zeiss Wildlife Conservation Award. 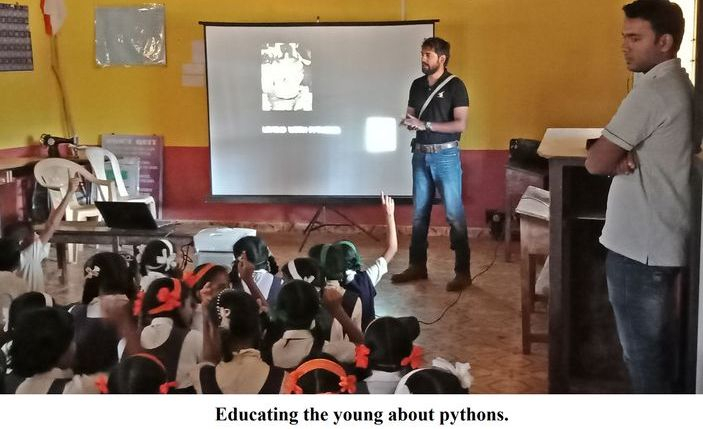 Combining scientific research conducted through field work with informing school children and educating the general population on the basis of this accrued knowledge is Nirmal’s modus operandi to changing the plight of snakes. He has also written a book called The Goan Jungle Book, which provides material on endemic species with which people are not familiar. Pythons are known for their large size, which contributes to myths such as pythons being able to devour humans or children whole. Being non-poisonous does not protect them from the dire effects of a badly or barely informed mind. The ‘Living with Pythons’ initiative, conceptualised and driven by the expertise of Nirmal, seeks to establish a relationship between humans and reptiles that will allow both to co-exist in tranquillity. India is home to three python species: the Indian rock python (Python molurus), the Burmese python (Python bivittatus) and the reticulated python (Python reticulatus). Of the three, the Indian rock python is the most common, found in forests and at the edge of human habitations. 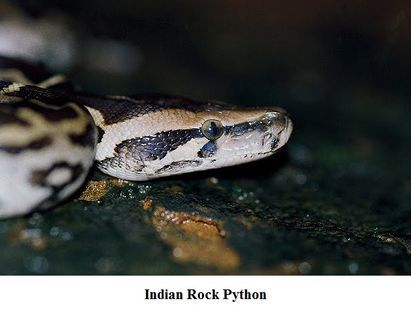 As humans destroy the Indian rock python’s habitat, they come in conflict with humans, who react by killing them or relocating them. The reticulated python, mainly found in Southeast Asia, has the distinction of being considered the world’s longest snake. There is a diminishing numbers of the Burmese pythons in Burma due to illegal skin trade and loss of habitat. They are, however, still found in the forests of Northeast India and need to be safeguarded. 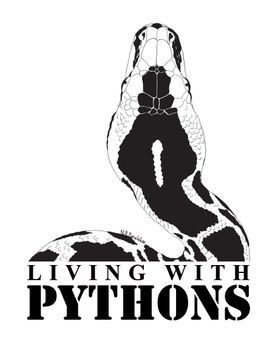 The nationwide initiative Living with Pythons, which began in 2017, aims at generating awareness and appreciation of these three species of pythons that are normally gentle, and rarely, if ever, attack humans, usually when unduly provoked. Nirmal says, ‘This initiative aims to promote acceptance and understanding about Indian pythons through conservation outreach, community engagement and field based herpetology research and techniques.’ With the aid of conservation science, Nirmal and his team hope to banish the fears and primitive beliefs inspired by the substantial length and girth of these fascinating creatures. 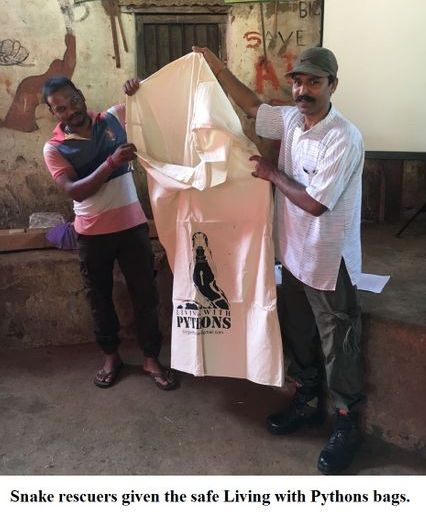 The initiative holds the honour of being, quite possibly, the most extensive national project connected with a snake species in recent times. The Living with Pythons initiative demystifies pythons by debunking popular myths by stating that children are not the natural food of pythons. A sense of pride is inculcated by the fact that India is home to the longest reptile and the value of these gentle, non-venomous giants is highlighted in their intrinsic significance to the ecosystem. People are informed that pythons are a protected species under the Wildlife Protection Act of India, 1972 and hence cannot be captured, handled or restrained without permission.